Flying to your family holiday destination may have its advantages in terms of speed, but there’s a lot to be said for taking the scenic route by car. For a start, the ferry journey isn’t the trial that it used to be in days gone by. I have some sickly childhood memories of seemingly interminable sailings of a ship creaking and lurching its way across choppy waters to France, but doing it today is a very different experience. We went on Brittany Ferries’ flagship the Pont Aven. The experience is far more like a luxury cruise than a perfunctory ferry. There are bars and restaurants that don’t rip off the captive sea-faring customer, interior and exterior lounge decks and, to complete that pampered feeling, there’s even a swimming pool. As there were five of us in the family, we went for a deluxe cabin. The extra space was fantastic – you get a large window (rather than a porthole), separate bathroom and toilet, television and dvd player. Moreover, they wake you up and feed you by bringing you breakfast in the morning. So it’s with a refreshing start that we arrived on French soil early on a quiet Sunday morning. It was a perfect day for driving 800km (to our overnight destination in Clermont-Ferrand), taking our time along France’s impressively expansive motorway network. 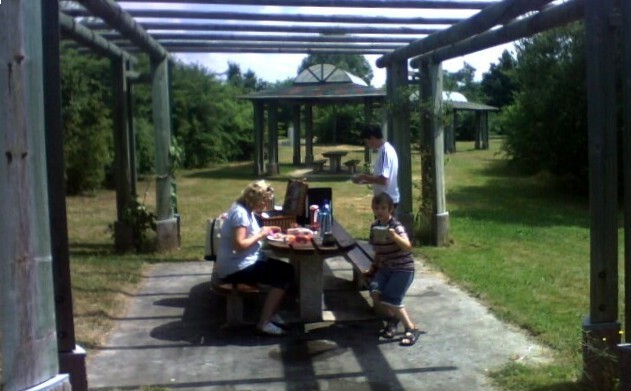 There are superb picnicking facilities at aires every 30km or so and we made optimum use of them, stopping regularly to brew coffee (we had packed our own camping stove), eat and refresh in the increasingly warm air. Fréjus is situated roughly midway between Cannes and St Tropez so you can’t get much more Riviera than that. This stretch of coastline – also known as the Cote d’Azur – is densely populated and initial impressions may be rather unromantic as you negotiate your way from the busy A8 motorway, through roundabouts and past one huge shopping centre after another. 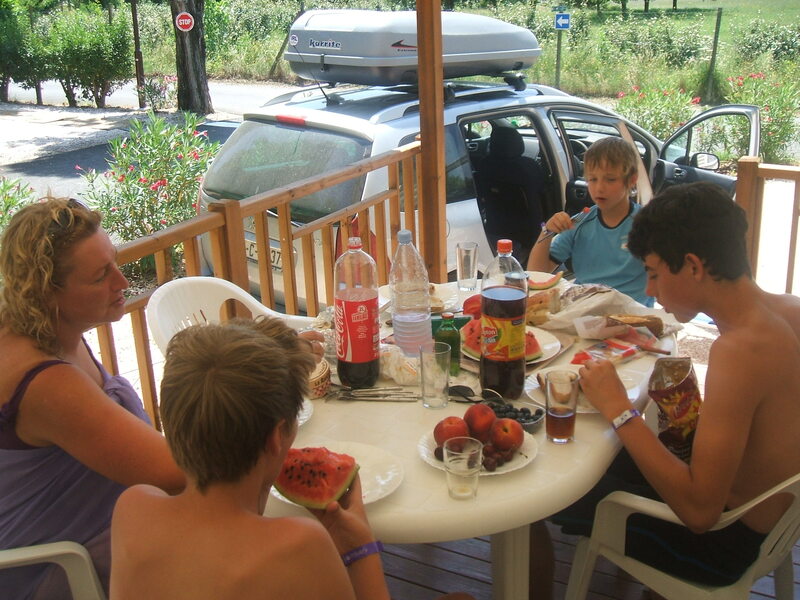 Our campsite – Le Montourey – was located down a very quiet road and surrounded on three sides by fields. The sites quiet location seemed unusual enough as most other campsites in the area are located in busier spots just off the aforementioned roundabout/dual carriageway/shopping centre settlements. Although the initial impression was that it was a bit lost, this is no bad thing as it turns out, as peace and quiet are not easy to come by in the Fréjus area close to the beach. The site was relatively small with approximately 180 places, but it had all the necessary ingredients: swimming pool with baby pool fully supervised and secure, two water slides, washing facilities, football pitches, tennis courts, shops, bar and daily fun activities for younger ones with nightly shows. Our boys, being aged 10 to 14, were just beyond the latter attractions, but they loved the pool and water slides to where they rushed off after breakfast, making friends with other campers, before playing soccer and/ or swimming in the evening. The nearest Lidl (they seem to be absolutely everywhere) was just a 5-minute drive while the much larger Carrefour hypermarket was slightly further away (about ten minutes by car) in a vast suburban retail area that had Décathlon (a wonderful source of good-value sports shopping) a whole plethora of specialised retail outlets and an Irish pub named Le Connemara. Something else that’s a short drive away is the centre of Fréjus itself. Amidst all the built-up that surrounds it, you can easily forget that Fréjus centre is a charming old Provencal town with an illustrious Roman past. Parking up or getting a local bus into the centre is well worth the effort. You get a real sense of the Cote d’Azur chic strolling through its ochre-tinged hot streets; the scents of the flowers and herbs of the Midi mixed with sun cream and expensive perfumes of passers-by. The Roman ruins are quite impressive and it was in Fréjus that the Roman military elite used to holiday. 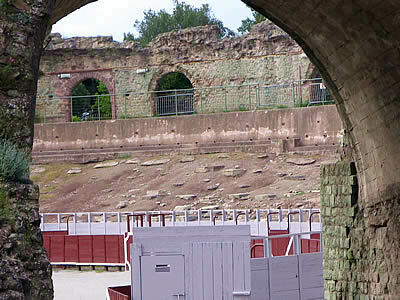 The amphitheatre is in a fairly ruinous state with many sections of it sectioned off for the public’s protection, but you do get an impression as you enter this mini-coliseum of the excitement and importance that it represented all those centuries ago. The beaches are clean and well-tended and we found them to be not as overcrowded as we had expected. We tended to go for St Aygulf beach immediately to the west of Fréjus. It’s very long and wide enough to accommodate the many thousands who frequent it, as is the large public car park beside it and across the road from it. If you’re looking for a more relaxed atmosphere, you won’t do much better than the 25-minute drive east to Agay. Here, the beach is set in a cove just before the village itself. 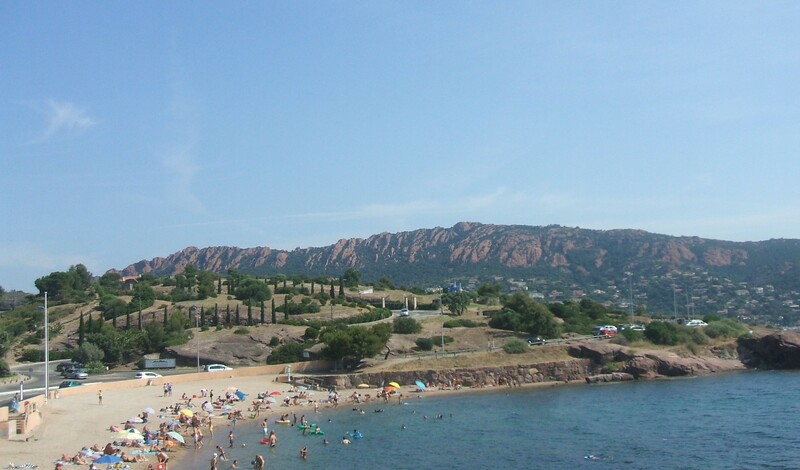 It’s one of the few places along the French Riviera coast that you can get a clear view of the sparsely-populated Esterel hills that form a rich red backdrop to the scene that gives a strong hint of what the Cote was like in its quieter heyday. Having bought snorkelling gear for all the family at Décathlon, we spent a couple of great afternoons finning around en famille amongst the spectacular large shoals of fish. During the summer months, there are plenty of markets in the surrounding towns and villages by day and also by night. St Raphaël – just down the road from Fréjus – closes off half of its main waterfront street for a large market of local crafts, toys and foodstuffs open until late, with accompanying amusements to amuse the children. We wandered around for a couple of hours, savouring the evening buzz of the holiday crowd in night-time temperatures of 25˚. Driving any great distance along the coast is not to be recommended during the summer. Although Fréjus is midway between Cannes and St Tropez, the former is a far more feasible journey to undertake than the latter. St Tropez is one of those places whose erstwhile charm has been swamped by over-popularity and over-development. Its situation at the end of a peninsula means that attempting to drive in summer is to be avoided at all costs unless being stuck in a day-long traffic jam in 35˚ is your idea of fun. It’s far more fun to go for a drive east towards the Italian border along the motorway. It’s a spectacularly beautiful drive between mountains and sparkling blue sea as the road takes you by towns that are all worth visiting, including Cannes, Antibes and Nice. In a little over an hour, you’re in Monte Carlo. Only someone with the hardest heart could not get a rush of James Bond-like emotions as your family car chicanes into the clean and groovy principality – all the more so when you’re accompanied by your Bond girl and Bond children. Most days, we tended not to stray too far. The camp site and its facilities offered a nice balance of relaxation and entertainment for all the family and we quickly settled into a routine of camp site in the morning and beach in the afternoon. After that, it was mostly a case of gathering essential supplies of food and drink before stocking with extra rations for long road home. – Conor Power was a guest of Brittany Ferries. Sailings are once weekly from Cork to Roscoff from April to October inclusive. For more information, see www.brittanyferries.ie or telephone (021) 4277 801. – Motorway tolls in France average around €5 for every 100km, except in Brittany, where the motorways are not tolled. – We stayed at Siblu’s Le Montourey campsite, 83600 Fréjus, France. For further details, see www.siblu.ie or call 0818 27 4099. – Our en-route stop was at the Hôtel des Puys, 16 Place Delille, 63000 Clermont-Ferrand, France. Tel 0033 473919206. www.hoteldespuys.fr.